Probate is a notoriously lengthy and expensive process. It is the legal process that happens after a person dies. One common misconception is that if there is a will in place, probate will not be necessary. This is not true. 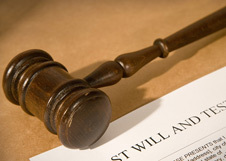 Assets distributed in a will must go through the probate process. This involves proving that the will is valid, identifying and creating an inventory of all the property of the deceased, appraisal of the property, paying debts and taxes, and distributing the assets to the beneficiaries. It can be a long and frustrating road of going to court, trying to get the court’s permission to sign off on an asset you cannot access because the signature of the deceased person is needed, and clearly that will not be possible to obtain. Save your loved ones’ time, money, and energy by putting an estate plan in place that avoids the probate process. At the Law Office of Thomas J. Hansen, you will receive an estate plan that meets the needs of you and your loved ones and takes into account things like how stressful and expensive probate is. Attorney Thomas Hansen has your best interests in mind when developing your estate plan. Living Trust. If you hold your property in this type of trust, it will not be included in your probate estate. After you pass away, the trustee transfers trust property to your heirs. You specify in the trust document who will inherit what, just like you would in a will. Joint Tenancy. Holding property as joint tenants can be an effective way to avoid probate. When you hold property as a joint tenant, you hold it jointly with another person. When you die, your ownership interest will pass directly to the co-owner of the property. Payable on Death. Financial accounts such as bank accounts and retirement accounts can be made into payable on death accounts. In order to do this, you need to fill out a firm listing your selected beneficiary. When you die, the money in the account will be directly accessible by the beneficiary without the need to go through probate. Make sure your retirement accounts have beneficiary designations! Stand Alone Retirement Trust. Create a trust and designate this trust as the beneficiary of your retirement account. This type of trust can have significant tax benefits for your heirs. As opposed to a lump sum distribution of your retirement account, the trust allows for payment in installments which will prevent the beneficiaries from getting quickly overtaxed. It will also pass outside of probate. Planning ahead allows you to evaluate all of your options and make informed choices. This is no different in estate planning. You have the chance to develop an estate plan that will make the estate administration process as simple as possible for your family and maximize cost and time saving opportunities like avoiding probate. The Law Office of Thomas J. Hansen has been expertly designing estate plans for over 20 years. Attorney Thomas Hansen is here to help you maximize the many benefits of estate planning. Contact the Law Office of Thomas J. Hansen today for all of your estate planning needs.